Going Green Irrigation designs, installs, and services quality, water-efficient landscape irrigation systems in the greater Austin Area. Through the use of the latest water conservation equipment, proper system design, correct controller programming, consumer education and water audits we will keep your landscape green while using up to 40% less water than the average system. Water conservation is important. New Name, Same Owners and Employees! 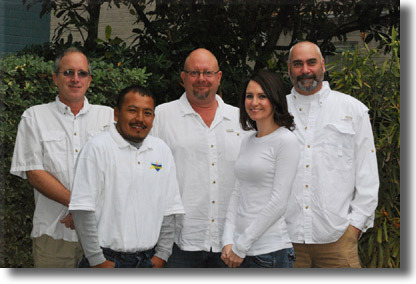 Hogan Irrigation, established in 1995 in Austin, Texas, has undergone a name change in 2010. We will begin operating under a new DBA as Going Green Irrigation. We feel that our name should say something about our underlying company philosophy, and Going Green Irrigation certainly does that. The 2009 summer's heat and drought have brought water conservation to the forefront in Texas in a huge way, and we take it very seriously. We have taken every step to ensure that the sprinkler systems we design, install and/or service will be as water-efficient as possible. We will continue to operate under the same corporation, still owned by the same folks – Kent Gursoy, Brad Badgett, and Eric Wise. Fallon Gaskamp will still be our Secretary, and German Olivares is still our Lead Service Technician. Poli Macedo and Neftali Macedo, who have been our Installation Foremen for over five years now will continue in their roles as well. All warranties given by Hogan will be honored in full, our phone number and mailing addresses will remain the same, and you will continue to receive the same great products and service from us than you have gotten in the past – just with a new name that we feel more truly reflects our mission. And, as always, thanks for choosing Going Green Irrigation, Austin!